1. 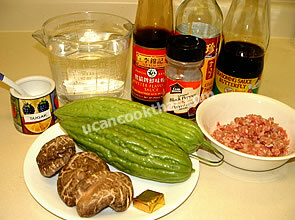 Season ground pork with oyster sauce, thin soy sauce, seasoning soy sauce, and ground pepper. Mix thoroughly and set aside. 2. Soak dried shitakae mushrooms in 2 cup water for 30 minutes or until soft. 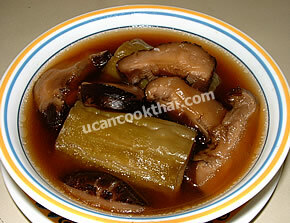 When mushrooms are soft, press out all water (keep mushroom water for making soup), cut stems, and slice into 1" length. 3. Wash bitter gourd, cut both ends off, and slice into 2-3 sections about 2" lengths. Scoop out the seed and the white fluff part. 4. Sprinkle salt all over the sliced bitter gourd (inside and outside), leave them for 30 minutes (this process will get rid of bitter taste), then rinse in water. Stuff each section of the bitter gourd with the seasoning ground pork (do not over-stuff), then place a toothpick in the middle of eash piece to prevent losing pork. 5. Pour water in a pot, bring to boil on medium-high heat, add chicken broth cube. When the soup is boiling, add stuffed bitter gourd, sliced shitakae mushrooms, and mushroom water. 7. When the bitter gourd is soft, remove from heat, put the soup in a bowl, remove toothpicks, and serve immediately. Did you find this recipe useful? Please consider making a donation to help defray the cost of managing and hosting the site. Thank you.